Increase your team’s productivity by working smarter, not harder. As your business grows, you will have to start hiring at some point. However, it doesn’t always have to be an immediate necessity. Hiring is a long, complicated and sometimes seemingly overwhelming process. The day will come when you’ll have to do it, and that’s not a bad thing, nor is it something you should be scared of. However, before making the massive decision to bring more people on board, you should first make sure you’re using your already existing resources as best as you can. With the right mindset and smart moves, there’s a good chance you can actually push back the moment of having to grow your team without overworking your existing support agents. The key is in the evergreen mindset of working smarter, not harder. Working harder and just ruthlessly pushing for more boxes ticked with no thought behind it will break your team and the people in it. However, putting in the effort to figure out ways to use your existing resources more efficiently⁠—working smarter⁠—will not only save your support agents a bunch of extra time, but it will also make them be and feel more productive and fulfilled. Today, we’re going to talk about five things you can immediately start doing to free up your existing support team’s time and energy for increased productivity. Most companies have a small handful of recurring issues that make up a disproportionate number of incoming support requests. Do you know what yours are? You should. There are a ton of customer support metrics and variables worth measuring, and seeing which issues take up most of your support team’s time is the one that will help you save the most time. Setting up a system to track support issues doesn’t have to be complicated⁠—we use labels in Groove to categorize tickets by issue, which lets us see which ones are eating up most of our attention. You can do this regardless of which tool you use for your support⁠—whether it’s adding labels in help desk software or organizing emails into folders in Gmail. The important part is getting an overview of which things are hogging your time so you can create a plan to fix it. 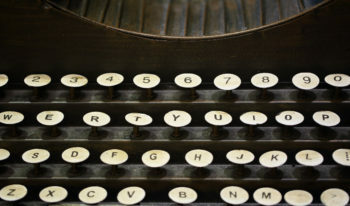 By fixing a couple of particularly prevalent bugs or clarifying some copy within your product that’s confusing people, you can eliminate a lot of constantly reappearing tickets, allowing your team to use that time to plough through more one-off issues. 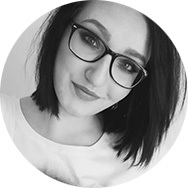 Sometimes, the best customer support solution is the one that helps your customers help themselves by giving them access to immediate knowledge without requiring any personal assistance. A self-serve knowledge base is also one of the most effective ways to quickly cut down on support tickets. Building a knowledge base takes effort, but the payoff is definitely worth it. You’ll be two steps ahead of your customers’ issues, and the self-solvers out there will be thrilled to not have to go through a complex process to fix their problems. Don’t have one yet? Fret not⁠—we’ve written an entire guide on building your first knowledge base to help you get started. Already have one? Awesome. Here’s the catch, though⁠—just having a knowledge base isn’t enough. 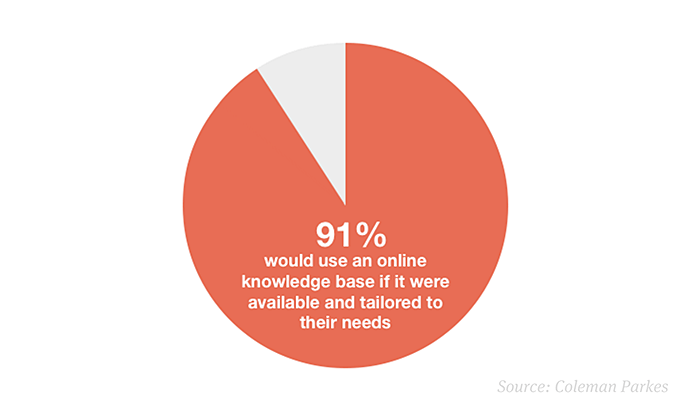 In a survey by Coleman Parkes, an epic 91% of consumers said they would use a single, online knowledge base if it were available and tailored to their needs. Having a great knowledge base readily available will save you time and money on high-volume, simple questions, and make your customers and support team feel happier and more productive. Another huge black hole of time wasted for many support teams is unnecessary back-and-forth with customers. That’s where first contact resolution⁠—FCR⁠—comes in. 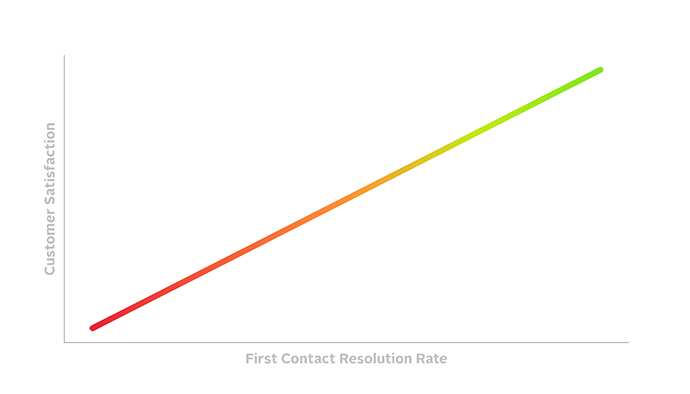 Just keeping FCR in the back of your mind is great, but first contact resolution rate (FCRR) as a concrete metric should also be regularly measured and consciously improved on. FCR-eligible means that you shouldn’t include any cases that would be basically impossible to get first contact resolution on (for example, if the customer makes an error in their email to you). By lowering the average number of replies that get sent per ticket, you can dramatically reduce the load on your support mailbox. We’ve written more in-depth about FCRR and how to improve it, so if you want to dig into the details of this magical metric, go check that post out. No matter the size of the company⁠—everyone can always benefit from automating tedious customer support tasks. Here’s an example: if your three-person support team each spends four hours per week on repetitive tasks, then automating those tasks can save you 200 hours per year, per agent; that’s 600 extra hours per year of productivity for your company. 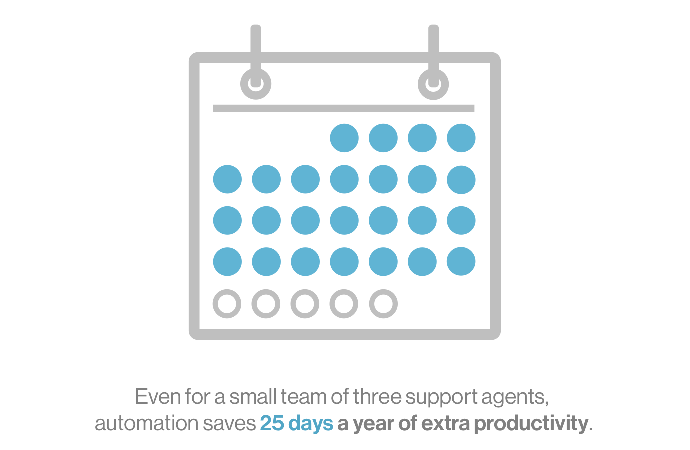 And as your team grows to, say, ten support agents, that number jumps to 2,000 hours saved every year. By choosing an app (we prefer Groove …obviously) that includes built-in productivity features, you can save hundreds of hours each year. 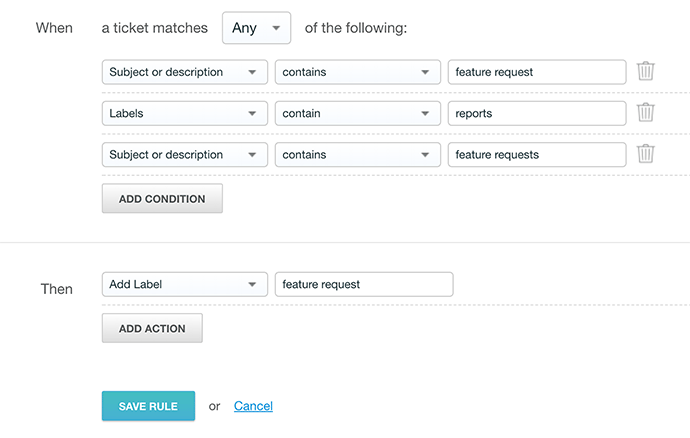 Rules and automation⁠—for not having to manually process, sort and file each incoming ticket. Collaboration tools like ticket assignments and private notes, which cut down on time and mental energy spent passing emails back and forth between the support team members. Common replies, which keep you from having to type the same responses over and over again. In a nutshell⁠—good software should do work for you⁠—take tasks off of your plate and make your team more productive. 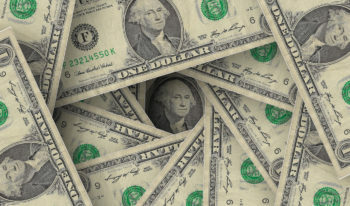 Besides just squeezing out more productive time from your support team, this can also translate to many thousands of dollars of savings⁠—dollars that you can apply to the not-so-cheap effort of scaling your business when it’s time for it. Just like there are repetitive tasks, tickets and assignments, there are also customer support processes that stay pretty much the same over time. …and whatever else you find important to have explained, written down and readily available. The documents serve as an easily accessible reminder or reference that eliminates the need to constantly check twice with your team members to make sure you’re on the same page⁠—kind of like an internal knowledge base. When you do eventually start growing your support team, you’ll save time on explaining all these procedures to new team members⁠—they can just get themselves up to speed by reading and then asking relevant questions. 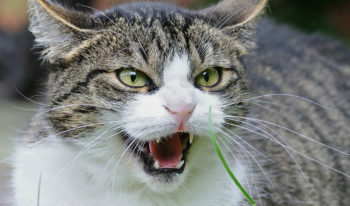 Mindlessly pushing for more work done in a team consisting of the same amount of people as before won’t benefit anyone. However, that doesn’t mean that you need to jump straight to bringing new people on board⁠—sometimes it’s just a matter of finding a way to use the resources you already have in a better way. What are your favorite smart moves to save time and get more done with a lean support team? Let us know in the comments!